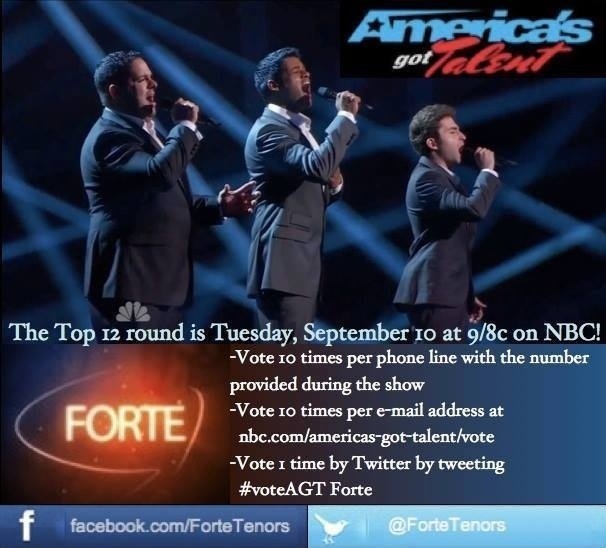 Fernando Varela, Josh Page and Sean Panikkar, members of the Tenor Trio, Forte, truly are three of the most gifted vocalists on the music scene today. And humble and gracious to boot! Below you will hear a recent interview they conducted on the Howard Stern Show, where their combined intelligence and transparent genuineness highlighted the reason they have achieved so many accolades during their involvement on America’s Got Talent Season 8. They have nothing but strong respect for their competitors on this show and they absolutely take nothing for granted. Which is why they need your votes more than ever now! On September 10th, 12 acts will perform on America’s Got Talent and they all have their eye on The Prize – a million dollars plus a headline act in Las Vegas. We will see some of the strongest performances ever from these 12 acts. No holes barred. However, in their recent interview on the Howard Stern Show, Forte mentioned that the song they will be performing on September 10th is something entirely different from what we have come to expect from them. Well, now! What can that be? Jazz? Country? Perhaps, something mid-tempo or uptempo? No one really knows – except Forte and the producers of America’s Got Talent – because details of the all the acts are kept under wraps. It’s a mystery! However, on our end, it is exciting to speculate. So speculate away in the comments section and call on your friends to vote like crazy for this enormously talented trio of singers. And, if you need any validation why you should take the time to vote for Forte, well then have a listen below. It will erase any doubt in your mind that these three talented artists deserve to go right to the top of the pack. Thanks Rosa! I am as well! Great interview! A success story to be sure – loved their ‘down to earth’ comments. Will be cheering them on – sorry that I can’t vote. As to what they will sing – smart of them to pick a song that everyone will recognize… and a different genre – I would love a Jazz song or maybe Reggae (spelling), though I don’t know how that would work – can’t ‘hear it’ in my mind. I look forward to the surprise. Awestruck / thank you. Maybe gospel. That would work with their voices. YES of course gospel! Though, up til now their song choices have been classical or ‘old’. Wonder if they will do something more recent – in a pop vein? They may! Fernando has a wide genre range so anything is possible. Josh as well. And Sean can adapt his voice beautifully. The secret will lie in the arrangement. And the success, of course. Hi Rosanne! Great post, as usual! I just hope the guys do not wander into rock or go too upbeat – and away from their FAN’s comfort zone. They need every vote they can get with the huge competition they are up against – Kenichi, Kristef Brothers, Branden James, etc etc etc. As usual, Rosanne, you are spot on with your comment about the “secret to their success will lie in the arrangement.” So far, they have been brilliant at this. Whatever, can’t wait! Behave! Suncatcher – me too re the President. But, this is a crisis situation and desperate times = desperate measures. Hopefully, he will be on at 8:00 and done in an hour. More than likely, Forte will be on in the second hour so we should be good to go. I am hoping that they will delay the AGT telecast until the President’s speech is done but then worry of the show runs too late and people decide to go to bed and not vote. Yes, I don’t want them to go too crazy but a gospel sound would be phenomenal I think. Time will tell. It’s all a guessing game so far. Ha! I would LOVE to hear them sing gospel!!! Brilliant. I guess we’ll find out shortly! All the best! AMAZING, I would love to hear them sing amazing grace, I love this trio more than the four tenors, fantastic.